Food fortification with iron has been recommended as one of the preferred approaches for preventing and eradicating iron deficiency for infant. However, infant cereal is one of the most difficult product to be fortified with iron. As it will provoke aroma, color and taste deviation. In addition, each iron salt has each level of bioavailability and its stability during keeping. Therefore, finding appropriate ferrous type in infant cereal and its stability during storage become more challenging. Thus, the aim of this research was to determine the appropriate iron types at certain concentration of fortification in prototype soya based infant cereal. The study covered to determine types and concentration of the iron added. Types of iron used in this research were ferrous sulphate (FeSO4), ferrous fumarate (C4H2FeO4), and ferrous pyrophosphate (Fe4(P2O7)3.8H2O). The level of iron fortification was set on 4 mg/100 g product correspond to 15% of daily value (DV) and 8 mg/100 g product correspond to 30% of daily value (DV). The selected sample undergo stability test at normal temperature for 12 months. Addition of ferrous fumarate and ferrous pyrophosphate at 4 mg/kg and 8 mg/kg were accepted by sensory (aroma and taste) and color as well as not significantly different with control (p<0.05). The acceptable iron for fortification in infant cereal at level both 4 mg/kg and 8 mg/kg were also stabil until 12 months during storage time. Many infants, children, and women of childbearing age, particularly in the poorer countries of the developing world, are iron deficient . About half of these iron-deficient individuals develop iron deficiency anemia (IDA), the most advanced form of the disease, which has several major negative impacts on health and contributes substantially to the risk of early death and disability . A newly published systematic review on July 2012 assessed specifically the impact of fortified infant cereals or fortified milk on infants and young children (6 months to 3 years) and revealed benefits of iron fortification and multimicronutrient fortification . Milk or infant cereals fortified with iron and a combination of other micronutrients help reduce the risk of iron-deficiency anaemia in infants and young children by 57%, whereas combination of all studies (single iron and multiple fortification) help reduce the risk by 50% . However, infant cereals are much more difficult to fortify with iron (Fe) due to organoleptic problems such as rancidity, color and flavor changes during storage after addition of soluble iron compounds . This has led to the use of less soluble, and hence less bioavailable iron compounds such as elemental Fe and ferrous pyrophosphate (Fe4(P2O7)3.8H2O) . Recently, ferrous fumarate had been proposed as an alternative for iron fortification of infant cereals. Ferrous fumarate (C4H2FeO4) is less soluble in water than ferous sulphate (FeSO4) but it is soluble in dilute acid such as gastric juice . Ferrous fumarate does not provoke organoleptic changes to the same extent as does ferrous sulphate but it still has a high relative bioavailability . Ferrous fumarate were also equally efficacious as fortificants of this infant cereal with electrolytic iron . Moreover, ferrous sulphate is also such another alternative option interm of price based on landed prices. Therefore, finding appropriate iron type in infant cereal become more challenging that indicate both the high relative bioavailability of iron and sensory acceptability in infant cereals at certain concentration level. By optimizing the iron bioavailability from infant cereals, the impact of these foods on iron status during early life could be probably improved. Previous research regarding iron bioavailability was measured as the incorporation of stable iron isotopes into erythrocytes after administration of labeled test meals 25 g dry wheat and soy infant cereal, 100 g water, and 2.5 mg Fe as [57Fe] ferric pyrophosphate or [57Fe]ferrous fumarate with ascorbic acid was added to all test meals 25 mg in study 1, 25, and 50 mg in study which resulted the geometric mean iron bioavailability was significantly higher from [57Fe]ferrous fumarate than from [57Fe]ferric pyrophosphate [4.1% (range: 1.7-14.7%) compared with 1.3% (range: 0.7-2.7%), n=8, P=0.008] which mean iron bioavailability from iron-fortified infant cereals can be improved by using an iron compound with high relative bioavailability and by ensuring adequate ascorbic acid content of the product . In addition, recent study done by Tjahjono (2010) for infant formula shown that iron sulphate was not acceptable for iron fortification in chocolate filled milk powder due to its high solubility which causes greyish colorisation as well as metallic taste after 15 minutes reconstitution . Therefore, the aim of this research was to determine the appropriate iron salt at certain concentration of fortification in prototype soya based infant cereal powder that were reconstituted at different temperature, based on mainly sensory evaluation as well as physicochemical. Types of iron used in this research were ferrous sulphate, ferrous fumarate, and ferrous pyrophosphate which cover its properties from low and high bioavailability as well as low and high solubility. The level of iron fortification was set on 4 mg/100 g (15% of daily value or DV) and 8 mg/100 g (30% of DV which corresponded to claim “source of iron” and “high of iron” as refer to General Guideline of Food Labelling published by Directore of Food Standard, National Agency of Drug and Food Control [7,8]. The temperature of water for reconstitution was proposed to adapt the consumer consumption behavior, 15°C for cold consumption, 45°C for warm consumption and 80°C for hot consumption. Stability test conducted as well for 12 months as considering the average storage time of this similar product sold in the market, which has normally 12 months for which iron salt selected to evaluate the impact during storage time. Target consument of this product is 6-24 months years old define in CODEX STAN 74 Standard for Process Cereal based Food for Infants. This experiment used were bulk infant cereal powder, calcium carbondioxide (CaCO3), vitamin premix and iron salt which were ferrous sulphate, ferrous fumarate, and ferric pyrophosphate with assay 97%. Equipment used were direct steam injection (DSI) line (capacity of 3000 kg per hour), roller drier (capacity of 2000 kg per hour), twin shaft mixer (capacity of 250 kg and 25 kg). While for analytical equipment, this research used UVVIS spectroscope, pH meter and Hunter Lab colorimeter. Base powder was taken from mass production line after dried in a roller drier. This base powder was composed by mixture of soya, rice, sugar, vegetable oil that was passed through hydrolisys and pasteurization step used a direct steam injection. This base was mixed with the minor ingredient (CaCO3, flavour, vitamin premix) used double paddle mixer to produce bulk infant cereal powder. To perform homogeneity test, 10 samples of ferrous sulphate fortified infant cereal at level of 4 mg/100 g of product which correspond to the lowest addition rate were taken from different point of area in mixing chamber. These samples was analyzed in its Fe content as a tracer. A Fe homogeneity was calculated based on coefficient of variation (CV). Homogeneity was acceptable when CV is less than 2% . This research was started by preparing bulk prototype of infant cereal powder based on three variables, which were type of iron, fortification level of iron and temperature of water for reconstitution. Bulk infant cereal powder which was made fix for all kind of tested iron, CaCO3, vitamin premix and iron 0.02- 0.08%, to reach minimum 4 mg (15%DV) and minimum 8 mg (30%DV) per serving. Reference of bulk infant cereal powder had the same composition but without iron fortification. The fortified infant cereal samples on powder level were analysed in terms iron content with minimal limit of 8 mg/100 g, ascorbic acid with minimum limit of 50 mg/100 g, total plate count (TPC) with maximum of 3000 cfu/g and organoleptic quality that required no significant different between sample versus non-fortified sample (control). Selected iron salt with its level of concentration obtained at previous step was then tested its stability during storage at a room temperature. Samples were tested its organoleptic and phycicochemcal qualities every month for 12 months. To determine the nutritional content of iron fortified infant cereal, physicochemical analaysis were evaluated , including sensory evaluation was done by for attributes taste and appearance [10,11]. While for the color evaluation conducted through Hunter Lab colorimeter. Based on the analytical result of iron content in each type of iron salt, the quantity of each iron salt to be added for delivering 15% and 30% daily value (DV) is calculated. With the Fe content 33 g/100 g, the amount of ferrous sulphate added were 0.0177% (dry matter) for 15% DV and 0.0354% (dry matter) for 30% DV. With the iron content of 32.7 g/100 g, the amount of iron (ferrous) fumarate added were 0.0179% (dry matter) for 15% DV and 0.0357% (dry matter) for 30% DV. With iron content of 21.1 g/100 g, the amount of ferrous pyrophosphate added were 0.0277% (dry matter) for 15% DV and 0.0553% (dry matter) for 30% DV. It is advised that generally the smaller the quantity to be dry mix, the more difficult to get it homogenous. Therefore the homogeneity test was based on iron analysis of bulk infant cereal powder with iron sulphate 15% DV (FIC IS15). Table 1 shows iron content in the bulk infant cereal of each Fe compound. Refer to Arancio (2009) it was concluded that from above Fe analysis (Table 1), with coefficient of variation (CV) <2%, the bulk sample was considered homogenous. Therefore this bulk was acceptable for next step in this research. With CV<2%, the bulk sample was considered homogenous. Table 1. Homogeneity result with iron sulphate 15%DV. Therefore this bulk was acceptable for next step in this research. Since the others bulk samples were prepared with the same mixing condition and mixing equipment, they were assumed having the same homogeneity as bulk infant cereal powder with iron sulphate 15% DV. There were 7 bulk prototype of infant cereal powder available which were control, ferrous sulphate, ferrous fumarate and ferrous pyrophosphate with 15% and 30% DV. Tables 2-4 present chemical, microbiological and organoleptic result of each sample. Sample of ferrous sulphate 15% and 30% DV found metallic taste and greyish color. The result of analysis shown iron content for 15% DV fortification was at average of 9.56-9.73 mg/100 g and 18.15-18.63 mg/100 g for 30% DV fortification which were higher than that of expected. One of the reason was because the presence of iron inbound from the non-iron fortified infant cereal powder, which had average value of 0.88 mg/100 g. All bulk samples had ascorbic acid minimum of 65 mg/100 g, Fe minimum of 8 or 16 mg/100 g, water activity with maximum of 0.2 and total plate count (TPC) with maximum of 3000 cfu/g. Based on the above data, all samples were confirmed acceptable for further analysis and the good TPC result above shown that the bulk was made and packed under hygienic condition.However due to on ferrous sulphate 15% and 30% DV found metallic taste and greyish color, therefore there were only five bulk prototype infant cereal powder acceptable up to this stage of research which were control, ferrous fumarate and ferrous pyrophosphate with 15% and 30% DV. Ferrous sulphate showed greyish colorisation in product because the iron formed metal ions which intensified the color of anthocyanin. The higher solubility the higher discoloration. Ferrous sulphate had high solubility (25.6 g/100 mL), while ferrous fumarate had very low solubility (0.63 rg/100 mL) and ferrous pyrophosphate is insoluble. The solubility was increased when temperature increase, therefore when hot water (80°C) is applied for reconstitution, the greyish colorisation was more obvious. The detected metallic taste found is also caused by the high solubility of ferrous sulphate, which was more obvious when iron concentration was higher. Figure 1 showed the appearance of infant cereal powder while Figure 2 showed the appearance of infant cereal after reconstitution. Fortified Infant Cereal with Iron Phosphate (FIC IP) showed the lightest color both in powder and reconstitution. Comparing to study done by Tjahjono (2010) on milk powder at pH at 6.6, the anthocyanin transformed to blue color, and mix with the white color of infant formula and brown color of cocoa, it could give grey colorization. The detected metallic taste found in reconstituted chocolate filled milk powder is also caused by the high solubility of ferrous sulphate, which was more obvious when iron concentration was higher. The anthocyanin in cocoa after roasting and conching is 0.01 g/100 g. If chocolate filled milk powder contain 4.5% cocoa powder (dry matter), per 100 g chocolate filled milk powder should contain 4.5%x0.01 g/100 g anthocyanin (0.45 mg anthocyanin). With serving size 27 g to prepare 180 mL of reconstituted chocolate filled milk, this milk solution should contain 0.12 mg anthocyanin or contain anthocyanin with concentration 0.675 mg/L. A reconstituted chocolate filled milk powder might have pH in the range of 6.5- 6.9, where at this range of pH, anthocyanin will undergo color fading. Irons that are soluble in neutral and/or acidic aqueous environments will form metal ion (Fe2+), as a result intensity of color, given by anthocyanin, will be increasing (Tjahjono 2010). In this step, means ferrous fumarat and ferrous pirophosphate fortified infant cereal sample was tested its stability during storage. Table 2. Iron and ascorbic acid contents of fortified soya based infant cereal. Table 3. Water activity, moisture, and total plate count of soya based infant cereal. Table 4. Sensory analysis result of fortified infant cereal powder in selection step. Figure 1: Iron fortified infant cereal powder selection. Figure 2: Iron fortified infant cereal reconstitution selection step. There were only five bulk prototype infant cereal powder acceptable up to this stage of research which were control, ferrous fumarate and ferrous pyrophosphate with 15% and 30% DV that would undergo for stability test subjected for both powder and reconstituted analysis. Tabels 5-7 showed aw, ascorbic acid and total plate count, result during keeping. Those were to confirm that no other reaction interfered due to unhyginenic condition. Ascorbic acid changes need to be observed as refer to Tjahjono (2010), if ascorbic acid was added dry during processing, the impact of iron as catalyst to degrade ascorbic acid during processing is expected low. There was no significant changing in aw value during storage (Table 5). It meant the possibility to have deterioration due to microbiological growth was minimum. Comparing result from study done by Tjahjono (2010), milk powder has aw of 0.2, where any reaction was expected at low speed, therefore it is also expected that the impact of iron fortification in fat deterioration is low during shelf life. Ascorbic acid content also did not change significantly during keeping quality test. Ascorbic acid degradation was not obvious up to 12 months (Table 6). This data showed that the impact of iron as catalyst to degrade ascorbic acid during processing is expected low. Crystalline ascorbic acid was relatively stable in dry air but was unstable in the presence of moisture. It is readily oxidized in aqueous solutions, first forming dehydro-L-ascorbic acid which is then further and rapidly oxidized . Traces of heavy-metal ions act as catalysts to the degradation of ascorbic acid. Studies on the stability of pharmaceutical solutions of ascorbic acid showed that the order of the effectiveness of the metallic ions was Cu2+>Fe2+>Zn2+ . Tjahjono (2010) reported that no significant ascorbic acid degredation in milk powder when added dry with aw of maximum 0.2. Moreover, it showed that total plate count remains below 3000 cfu/g during storage (Table 7) which mean possibility to have deterioration due to microbiological growth was minimum. Refer to the above results, the control 1 (FIC ref), iron (ferrous) fumarate 15% DV (FIC IF15) and 30% DV (FIC IF30) as well as iron (ferric) pyrophosphate 15% DV (FIC IP15) and 30% DV (FIC IP30) had ascorbic acid of minimum 65 mg/100 g, aw maximum of 0.2, total plat count of maximum 3000 CFU/g, and color above 80%. Based on those data, all samples were confirmed acceptable for further analysis. Tjahjono (2010) reported that ferrous fumarate and ferrous pyrophosphate were acceptable for chocolate filled milk powder. The research also indicated that the iron fortification at level of 10% and 20% DV had no give significant impact on fat oxidation and ascorbic acid degradation at fresh and keeping quality for 6 weeks at 37°C. The analyisis were done in reconstitution sample as well. The temperature of water for reconstitution was proposed to adapt the consumer consumption behavior also, i.e. 15°C for cold consumption, 45°C for warm consumption and 80°C for hot consumption. Table 8 showed L score of infant cereal powder during storage at cold, warm and hot reconstitution sample as part of sensory score. L score used to know the luminance or lightness component, which ranges from 0 to 100. Thus the color changes can be assessed objectively. All prototype samples (in 50 g packing format) were reconstituted with 150 mL of water, and analyzed for chemical (pH) and organoleptic properties. The sensory score of all samples during storage (fresh versus up to 12 months) were within the expected range. It shown that he fat oxidation (rancid taste) was not detected for all sample from fresh and up to 12 months in normal temperature. Figure 3 showed the appearance of infant cereal after keeping. It showed that all samples from stability test were acceptable against reference when observed both at 0 and 15 minutes after reconstitution. Therefore, the selected iron was ferrous fumarate 15%DV and 30%DV as well as ferrous pyrophosphate 15%DV and 30%DV. Moreover, the negative linear trendline was observed during storage of fortified ferrous fumarate and ferrous pyrophosfate samples at level 15% dan 30% DV. All sample was still above 80% sensory result with R2 of 0.8 as refer to Figure 4. That means all sample still were acceptable until 12 months keeping. While refer to study done by Mardiyah (2012), the infant cereal used in this study was based on white-wheat flour and soy and contained moderate amounts of phytic acid (a strong inhibitor of iron absorption in infants) containing amounts of ascorbic acid (a potent enhancer of iron absorption in infants), were added to all test meals, resulting in molar ratios of 3.2:1 to 6.3:1 relative to added iron. It shown that intake of one serving of an infant cereal fortified with ferric pyrophosphate or ferrous fumarate would provide a mean of 32.5 compared with 102.5 mg bioavailable Fe, equivalent to 4.3% and 14%, respectively, of the estimated daily requirement of absorbed iron in infants aged 4-12 mo (0.75 mg/d). The energy content per serving (465 kJ) would contribute <13% of the average energy allowance for infants aged 6-12 months. Thus, the amount of bioavailable iron supplied by the infant cereal fortified with ferric pyrophosphate is limited and products fortified with this iron compound may not be expected to have any major effect on iron nutrition. When ferrous fumarate was used as the iron fortificant, the cereal provided a balanced amount of bioavailable iron relative to the energy content . In this case the result of this study that use soya based infant cereal was align with previous study carried out in wheat based infant cereal. Table 5. Water activity changes of infant cereal powder during storage. Table 6. Ascorbic acid changes of infant cereal powder during storage. Table 7. Total plate count of iron-fortified infant cereal powder during storage. Table 8. L scores and taste result of iron-fortified infant cereal during storage. 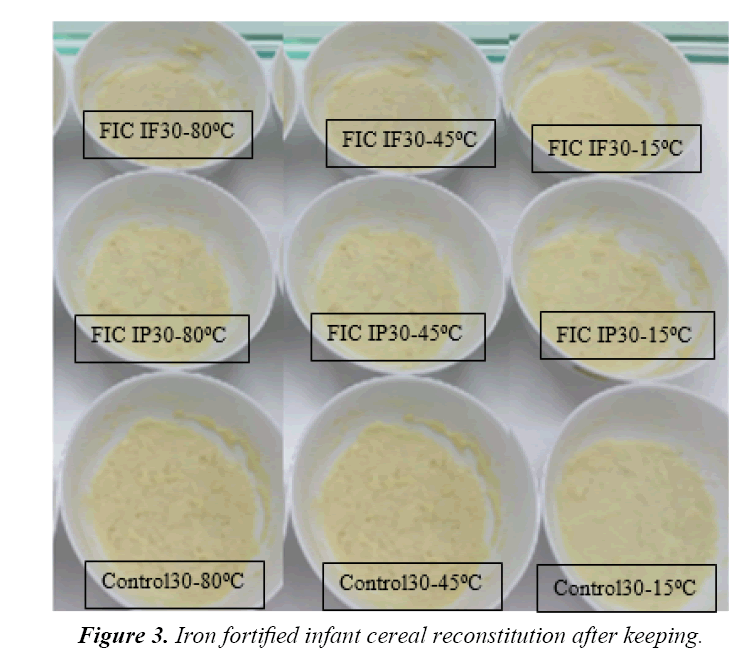 Figure 3: Iron fortified infant cereal reconstitution after keeping. 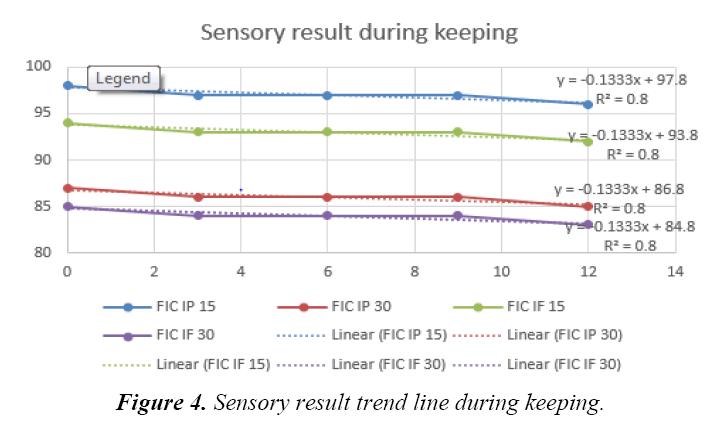 Figure 4: Sensory result trend line during keeping. Process soya based iron fortification in infant cereal under homogenous condition with acceptable microbiological requirement. Iron sulphate was not acceptable for iron fortification in infant cereal powder due to its high solubility which caused greyish colorization as well as metallic taste and happened 15 minutes after reconstitution. Therefore, the acceptable iron for fortification in infant cereal powder at level both 15% and 30% DV, reconstituted at 15-80°C are ferrous fumarate and ferrous pyrophosphate. These samples showed relatively stable during storage in terms of organoleptic, microbiological and physicochemical qualities. All authors declare that there are no conflicts of interest regarding the publication of this paper. Hurrell R F, Lynch S, Bothwell T, et al. Enchancing the Absorption of Fortification Iron A Sustain Task Force Report, Bo Lönnerdal CRC. 2004. Mehansho H, Nutrition Science Institute. Iron fortification technology development. Snacks and beverage technology development division, The P&G Co., Cincinnati, OH 45239 - New Approaches. J. Nutr, 2006;136:1059-63. Ziegler E. Formon S, Nelson S, et al. Dry Cereals Fortified with Electrolytic Iron or Ferrous Fumarate Are Equally Effective in Breast-fed Infants. J Nutr, 2011;141:243-8. Formon SJ. Bioavailability of Supplemental Iron in Commercially Prepared Dry Infant Cereals. J Pediatr, 2010;110: 660-1. Tjahjono DH. The Selection of Iron Type as Fortificant in Chocolate Filled Milk Powder, 2010. Direktorat Standardisasi Produk Pangan. Acuan Label Gizi Produk Pangan. Badan POM RI, 2007. Arancio P. Homogeneity testing for dry mixing in batch operations. Nestle Product Technology Centre Orbe – Switzerland, Wiley VCH Verlag GmbH. 2009. AOAC, AOAC. Publications of Official Testing Methods-Association of Analytical Chemists. Official Methods of Analysis, USA, 2000. Ottaway P B. The technology of vitamins in food. Berry Ottaway and associates Ltd, 1993. Mardiyah D. Bioavailabilitas Besi Konsumsi Pangan pada Remaja Putri Anemia dan Non Anemia, 2012.